When we consider the history of post-war art and artists in Quebec, it now seems inexplicable that works by Jean Lefébure were so seldom exhibited during his lifetime. Born in Montreal, he studied architecture at an early age but was more interested in painting. Although only 17 years old and self-taught, Lefébure sought out and became acquainted with the artists who became signatories of the Refus global manifesto in 1948, and he counted Paul-Émile Borduas and Pierre Gauvreau among his mentors. In 1949 Lefébure left for Europe to broaden his cultural education. He spent time in Spain, where he exhibited his first abstract paintings, and eventually settled in Paris. After his return to Canada in 1965, he began what became a long career teaching in the fine art departments of Laval University and then CÉGEP de Saint-Laurent in Montreal. By all accounts, Lefébure was a much-admired teacher who was content to stay out of the limelight as an exhibiting artist. 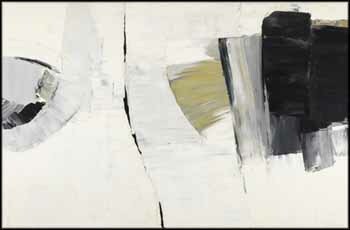 La nef aux vents demonstrates the artist's sure hand in the application of pigment and control of the subtle palette typical of his best abstract works. Heffel's remains the premier venue to buy and sell important Canadian Art. We continue our tradition of market leadership with record breaking auctions. At Heffel's, you will work with the most experienced team of specialists in the business to help you buy and sell your fine art. Consign with Heffel and we will provide you with the best opportunity to maximize the value of your works.